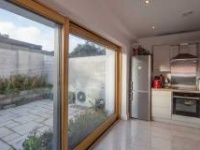 In spite of a dauntingly complex and crumbling existing building, a detached house in Donnybrook has been modernised to become Ireland’s 2nd certified Enerphit building. If this project proves nothing else, it’s that passive standards can be achieved in the most unlikely situations. The decision to go for Enerphit didn’t come until after planning permission had been granted. This put serious limitations on the amount of reworking that could be done in order to achieve the higher thermal performance. In addition, the client had set out precise specifications for the internal layout of the house which were non-negotiable. There were the inevitable budgetary restrictions and with the south side of the house facing onto the street, even the orientation was wrong. 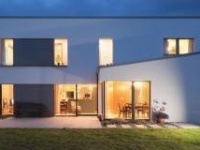 Add to that the normal challenges of deep retrofit, this Dublin suburban Enerphit project represents a remarkable achievement for both the design and construction teams. “The client has a large family and very specific design requirements,” says Archie O’Donnell of Integrated Energy, who was energy consultant on the project. “They wanted open plan living, they wanted lots of light and they wanted to open up the garden.” Because the existing house fell far short of what was required, demolition would have been the first choice, but planning restrictions required an element of retention on the project. It was design with one arm tied behind your back. And the biggest challenge, everyone knew, would be airtightness. The house had been extended many times over the years, which meant that there were a variety of wall types, including nine inch hollow block and cavity wall, with some brick faced fronts. There were particular concerns about air infiltration in the rising walls. Though the client would have liked to retain some of the internal walls and existing timber floor, he conceded that these would have to be removed in order to facilitate the airtightness strategy. Even at that, it was felt at tender stage that while all other Enerphit criteria could be met, the air change rate of 1 ACH would be a bridge too far. For that reason, the tender documents specified a slightly higher air change rate in order to protect the budget. 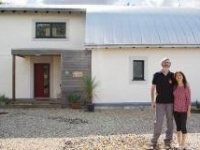 Cyril Mannion of Mannion Passive House Builders won the tender, and though he had no contractual obligation, he nonetheless committed to achieving the Enerphit airtightness standard at the existing budget. The reality was that the existing structure was not fit for purpose and ultimately only the bare minimum could be retained. “We were left with this skeleton of a house,” says Cyril Mannion. “To be honest we were nearly afraid it would fall, so we were tiptoeing around that for a while until we got it back up again.” Deemed unsavable, the left hand gable was demolished and rebuilt, with two courses of low thermal conductivity Quinn Lite blocks used to reduce cold bridging at DPC level. While the structure was dry, the internal faces of walls had considerable mould growth in bathrooms and some bedrooms to the north of the house due to surface condensation. The form of the building was driven largely by planning constraints and the client’s requirements. But though the passive imperative may have arrived post planning, Bright Design’s plan had in any case embodied many low energy principles. A dual aspect living space neatly captures solar gains from the south facing street, while a terrace in the front garden helps keep that space private and informal. In addition, the glazing strategy had also taken account of maximising solar gains without risking overheating. Roof glazing, for example, introduced heat and light into the core of the house via a stair course. It was a painstaking, iterative process. The architect might begin with a detail of what he wanted to achieve aesthetically and the energy consultant would then add details on insulation and airtightness. These drawings were shared in the cloud, moving back and forth between them until each was agreed and finalised. Mark Shirley of 2eva performed two airtightness tests on the house. The first result came in at 0.7 ACH, well inside the Enerphit standard. “If we had done nothing else with it,” he says, “that would have been an exceptionally good result because the building is large and architecturally complex.” He points out that experience is key to getting a good airtightness result, and notes that the more projects a builder has worked on, the less materials he needs to achieve a set target. According to lighting designer Rocky Wall of Wink Lighting, the lighting design was driven by energy efficiency without compromising on aesthetics. “The net result is a super-efficient lighting system that compliments the architecture of the building,” says Wall, adding that downlighters were kept to a minimum to avoid compromising the airtight layer. “Also downlighters are a very poor light source,” says Wall. “They were really only designed to highlight an object or a feature. They became fashionable because of their physical size as opposed to their illuminating ability.” Instead the lighting strategy relies predominantly on LEDs and fluorescent lamps, including innovative dimmable LED wall lights. Ventilation required quite a bit of design work. It was decided that the house would be divided into two separate regions, each with its own MVHR unit, extracting and supplying the rooms in its half. In order to achieve this, the bedrooms were fitted with drop-down acoustic seals, which were automatically lowered from within the door leaf when the door was closed. While this achieved the acoustic separation the client wanted, it interfered with the passage of air that the ventilation strategy required. In response, it was decided to extract and supply to each room individually, or, in the case of en suites, to extract from en suite and supply to its adjoining bedroom. Extra ducting was required to make this work, with additional acoustic attenuators to limit sound transfer via the MVHR system. There were also knock-on effects on the Enerphit calculations. 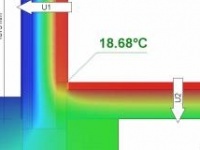 The use of two systems required additional energy, which was compensated for by improvements to the fabric, and of course the better than expected airtightness performance. Before: heating and hot water bills had been €4-5,000 per annum – and the building wasn’t able to maintain 18C during the heating season. After: an estimated total for heating/hot water of circa 8800/2700 kWh, totalling circa €850 per annum. Original walls: a combination of uninsulated cavity wall and single leaf nine inch hollow block walls. Original roof: cut timber roof with circa 100mm fibre glass insulation on attic floor. Flanking roofs: as above on slope except with 175mm rafter, no plasterboard and no service cavity. Flat of flanking roofs includes Paralon roofing felt and 120mm of Paratorch insulation; 225 cellulose and Intello airtightness membrane. Slopes of flanking roofs include 80mm Xtratherm sarking board, and 175mm pumped Warmcel celluloseinsulation, and Intello airtight membrane. Original windows & doors: double-glazed PVC windows, glazed hardwood front door and doubleglazed hardwood windows and doors to rear utility. Before: standard efficiency gas boiler and radiator system. After: 30kW 93% efficient Worcester Bosch Greenstar modulating condensing gas boiler with Heatmiser PRT-TS / PRT-NTS controls & radiators. Two 6.97 kW 81% efficient Gazco Studio 2 balanced flue – room sealed – gas fires. Lighting: predominantly LEDs and fluorescent lamps, including dimmable LED wall lights. Beam Vacuum & Ventilation are market leaders in central vacuum & mechanical ventilation systems throughout Ireland & UK.